Purana Qila or the Old Fort is a magnificent structure speaking volumes about the history of Delhi. An architectural masterpiece of the Mughal art, this fort was built in the 16th century by the Mughal emperor Humayun. He built it in an endeavor to build a city of his own. But unlike other Mughal rulers Humayun didn’t name his city after him. The fort is also known as Dinpanah meaning the 'refuge of the faithful'. Sher Shah Suri conquered the Old Fort after defeating Humayun in the year 1540 and renamed it as Shergarh. He demolished several structures of the fort and later added several new structures. Later after fifteen years Humanyun could win his fort back from the Shah dynasty. 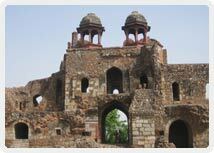 The Purana Qila or the Old Fort has three main gates - the Humayun Darwaza, Talaqi Darwaza and the Bada Drawaza. The double-storied gates are massive and are built with red sandstone. The northern gate is the Talawi Darwaza from which entry is forbidden. One of the most fascinating buildings in the Purana Qila complex is the Qila-i-kuhna Masjid. The mosque built by Sher Shah Suri in 1541 has a prayer hall with five doorways with true horseshoe-shaped arches. The original plan was to construct the mosque entirely in marble, but short supply forced the architect to use red sandstone instead. A spectacular construction resulted - the red sandstone and the marble contrast beautifully with each other to give the mosque a very distinctive air. The mihrabs or prayer zones inside the mosque are richly decorated with concentric arches. The Sher Mahal, an octagonal structure, is another attraction of the fort. This beautiful structure was built for entertainment purposes. 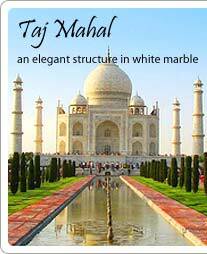 It reflects the perfect blend of the Mughal and Hindu styles of architecture. It is now an observatory. The museum inside the fort displays a variety of artifacts reflecting the glory of the Mughal period.